I have got to mark our calendar on April 24! Berto and I have yet to dine in Chili's together. We have been planning to go for the longest time, but somehow we always cancel. April 24 is a big day since it is a Burger Day at Chili's! 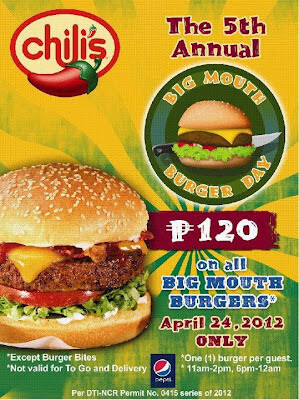 Now on their 5th year, they are selling all their Big Mouth Burgers for a special price of P120 only! This promo is not valid To Go or delivery. One (1) burger per guest. From 11 am - 2pm, 6pm - 12am, and at Rockwell 11 am - 2pm, 6pm - 9pm.